Kyle Grillot - kgrillot@shawmedia.com Marengo junior Weston Shepard (4) puts up a shot under goes to put up a shot under pressure from Harvard seniors Angel Sanchez (10) and Tate Miller (23) during the first quarter of the boys basketball game of the Castle Challenge Friday in Harvard. Marengo beat Harvard 54-45. Kyle Grillot - kgrillot@shawmedia.com Marengo senior Andrew Volkening (40) puts up a shot under pressure from Harvard seniors Zach Martin (20) and Tate Miller (23) during the first quarter of the boys basketball game of the Castle Challenge Friday in Harvard. Marengo beat Harvard 54-45. Kyle Grillot - kgrillot@shawmedia.com Harvard senior Angel Sanchez (10) passes the balll guarded by Marengo senior Andrew Volkening (40) during the third quarter of the boys basketball game of the Castle Challenge Friday in Harvard. 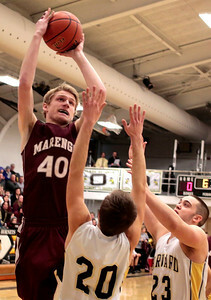 Marengo beat Harvard 54-45. 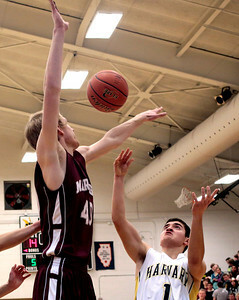 Kyle Grillot - kgrillot@shawmedia.com Harvard senior Fernando Carrera's shot is blocked by Marengo senior Andrew Volkening (40) during the first quarter of the boys basketball game of the Castle Challenge Friday in Harvard. Marengo beat Harvard 54-45. Kyle Grillot - kgrillot@shawmedia.com Harvard senior Justin Nolen puts up a shot under pressure from Marengo senior Justin Velasquez (20) and junior Weston Shepard (4) during the first quarter of the boys basketball game of the Castle Challenge Friday in Harvard. Marengo beat Harvard 54-45. 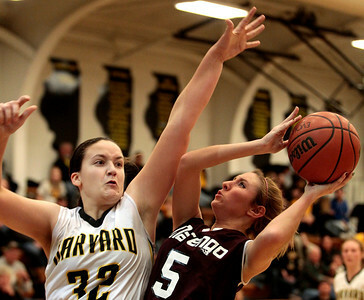 Kyle Grillot - kgrillot@shawmedia.com Marengo senior Nikki Hammortree (5) puts up a shot under pressure from Harvard senior Abby Linhart (32) during the fourth quarter of the girls basketball game Friday in Harvard. Harvard beat Marengo 43-41. 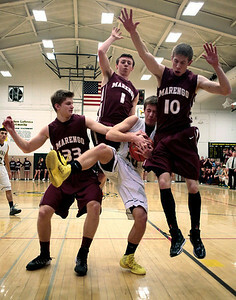 Kyle Grillot - kgrillot@shawmedia.com Harvard seniors Zach Martin (20) tries to get through the defense of Marengo senior Adam Rogutich (33), junior Koty Kissack (1) and Max Kunde (10) during the second quarter of the boys basketball game of the Castle Challenge Friday in Harvard. Marengo beat Harvard 54-45. Kyle Grillot - kgrillot@shawmedia.com Marengo senior Taylor Carlson (20) puts up a shot under pressure from Harvard senior Abby Linhart (32) during the fourth quarter of the girls basketball game Friday in Harvard. Harvard beat Marengo 43-41. 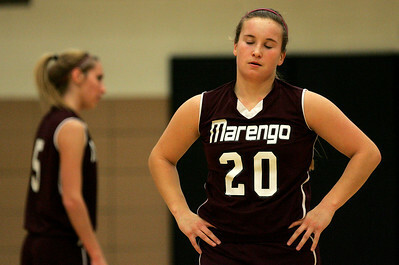 Kyle Grillot - kgrillot@shawmedia.com Marengo senior Taylor Carlson (20) reacts after a foul was called on her during the second quarter of the girls basketball game Friday in Harvard. Harvard beat Marengo 43-41. 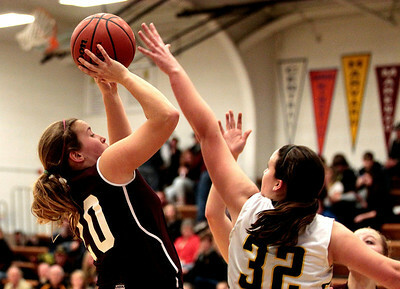 Kyle Grillot - kgrillot@shawmedia.com Harvard senior Abby Linhart (32) goes to put up a hot under pressure from Marengo junior Rachel Tautges (2) during the first quarter of the girls basketball game Friday in Harvard. Harvard beat Marengo 43-41. Kyle Grillot - kgrillot@shawmedia.com Marengo senior Lynsey Hoeske (3) puts up a shot under pressure from Harvard senior Abby Linhart (32) during the third quarter of the girls basketball game Friday in Harvard. 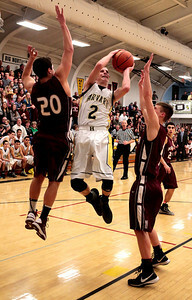 Harvard beat Marengo 43-41. Kyle Grillot - kgrillot@shawmedia.com Harvard's Jose Meija wrestles Marengo's Brandon Dierkes during the 170-pound match of the Castle Challenge Friday in Harvard. Harvard won the meet, 50-24. Kyle Grillot - kgrillot@shawmedia.com Harvard senior Abby Linhart right and Marengo junior Rachel Tautges (2) fight for a lose ball during the first quarter of the girls basketball game Friday in Harvard. Harvard beat Marengo 43-41. Kyle Grillot - kgrillot@shawmedia.com Marengo's Kyle Gara wrestles Harvards Matthew Wheeler during the 160-pound match of the Castle Challenge Friday in Harvard. Harvard won the meet, 50-24. Kyle Grillot - kgrillot@shawmedia.com Marengo's Corey Graham smiles at the crowd after wrestling Harvard's Joe Quinn during the 126-pound match of the Castle Challenge Friday in Harvard. Graham won the match. Harvard won the meet, 50-24. 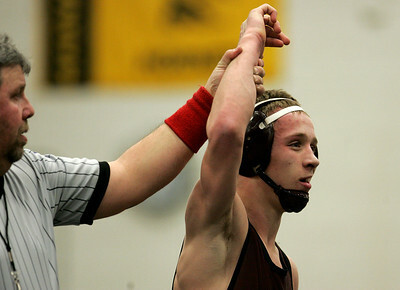 Kyle Grillot - kgrillot@shawmedia.com Marengo's Corey Graham looks to the referee while wrestling Harvard's Joe Quinn during the 126-pound match of the Castle Challenge Friday in Harvard. Graham won the match. Harvard won the meet, 50-24. Marengo senior Andrew Volkening (40) puts up a shot under pressure from Harvard seniors Zach Martin (20) and Tate Miller (23) during the first quarter of the boys basketball game of the Castle Challenge Friday in Harvard. Marengo beat Harvard 54-45.